The marine area in our district is busy with different activities as shown in this map: (open the map in internet explorer to activate the layers). Commercial developments range from sea defences and new marinas to offshore wind farms and aggregated dredging. These developments take place with existing activities like commercial fishing, shipping and recreational sports. With lots of different activities and developments occurring in the same area, management is needed. Marine plans and marine licensing are used to manage where, when and how developments and activities take place in our district. Non-fishing activities e.g. aggregate dredging, cable laying and sea defence works need a marine licence from the Marine Management Organisation. Marine licensing information is available here. Major projects e.g. offshore wind farms need Government consent via the Planning Inspectorate. More information is available here. Eastern IFCA provides guidance to the Marine Management Organisation and to the Planning Inspectorate by responding to consultations on marine licence or planning applications. Our role is to highlight fisheries and conservation aspects that need to be taken into account, for example local knowledge on fish spawning or nursery grounds. 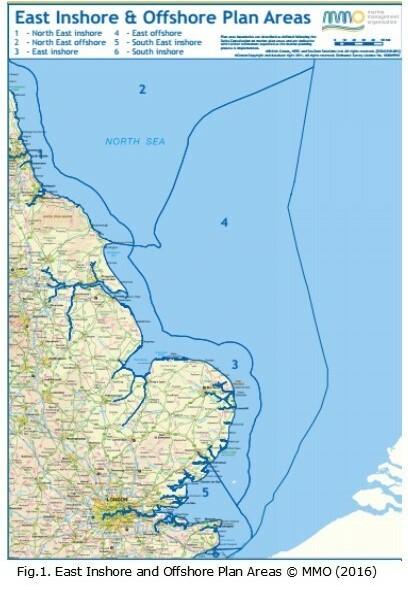 The Marine Plans for the East of England cover parts of the North Sea between Flamborough and Felixstowe (Fig.1). The Inshore plan includes coastal waters out to twelve nautical miles, and the Offshore plan includes waters beyond 12 nautical miles out to the UK territorial boundary. The Plans set out objectives and policies for marine sectors and governance, including fisheries and conservation. Marine Plans support sustainable development by providing guidance to decision-making authorities, such as the IFCAs. A video about marine planning is available here. The East (Inshore and Offshore) Marine Plans are available here. An interactive system showing marine policy documents for different areas is available here.